NEDA-8 regional director Bonifacio Uy hands over the M16 Rifle during the Ceremonial Entrustment of Firearms to the newly enlisted privates on February 3, 2018. CAMP LUKBAN, Catbalogan City – One hundred twenty eight (128) new breed of soldiers were enlisted into the ranks of the Army’s 8th Infantry (Stormtroopers) Division during the Closing Ceremony of Philippine Army Candidate Soldier Course Class 488-2017 held at the 8ID Jungle Base, Camp Eugenio Daza, Barangay Fatima, Hinabangan, Samar at 10 am on February 3, 2018. The closing ceremony was graced by Atty. Bonifacio G. Uy, Regional Director, National Economic Development Authority (NEDA) Regional Office VIII as the Guest of Honor and Speaker who further led the ceremonial entrustment of firearms, distribution of certificates and awarding of individual achievements. 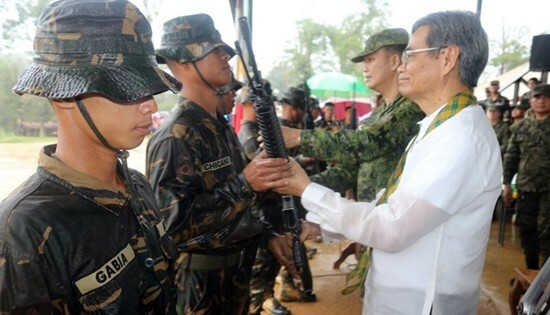 The entrustment of firearms to the new enlisted privates symbolizes their responsibilities and commitment to the people and the country. Major General Raul M. Farnacio, Commander, 8ID lauded the Division Training School personnel who were responsible for the training of these new soldiers, who will be later distributed to different line units of 8ID in Eastern Visayas. The newly enlisted privates will boost the troops of 8ID that will go after the CPP-NPA Terrorists in the region and help establish an environment conducive for peace and development. QUEZON CITY – Youth activists reacted to statements of President Rodrigo Duterte on Thursday to lumad parents of not needing to worry about sending their children to college now that free education will be provided under his administration’s Republic Act 10931 or the Universal Access to Tertiary Quality Education Act. In an emailed statement, the Samahan ng Progresibong Kabataan (Spark) together with KAISA UP claimed that the President “was merely weaving lies and giving false hopes to parents in order to douse the growing social discontent and frustration towards his administration which promised and deliberately failed to deliver lasting social change”. Under RA 10931, which is expected to be implemented by the upcoming academic year, tuition and other school fees in state and local universities and colleges (SUCs and LUCs) are to be subsidized by State for qualified students. There is also a Tertiary Education Subsidy (TES) to augment the other costs of tertiary education. “Far from what state officials have been peddling, there is a huge disparity between the supposed intention of the law and its actual contents”. Spark’s spokesperson, Jade Lyndon Mata said that under the law, “free education remains to be not free, inaccessible, and mentions nothing on the quality of education, totally unreflective of the law’s title”. “The mere existence of the Student Loan Program (SLP) in the law attests that tertiary education remains to be not free, even profiting from students with long-term loans to be collected by the government through SSS and GSIS contributions,” Mata added. “These loans and the voucher system only reinforces the existence of private higher education institutions (HEIs) and ensure their profit while having no aim to further capacitate public learning institutions,” he added. “Duterte even that Lumad youth can obtain free education in schools like Ateneo, La Salle and San Beda”. Student leader and chairperson of KAISA UP Shara Landicho also pointed out that a big percentage of students from poor families will be unable to access the perceived gains of the law. She said that “given the current situation of the entire education system, those who came from private or science high schools are the ones most likely to be awarded free education. This scheme will not allow the students from poor families who need it most to avail of free tuition”. “Another glaring flaw of the law is the absence of an automatic appropriation provision to fund the law annually, it leaves its implementation unstable and questionable, similar to the Reproductive Health law. This inadequacy is a major and glaring flaw if it genuinely seeks to provide universal access to those who wish to pursue tertiary education,” she asserted. The groups concluded that without major amendments to the Free Education Law, Duterte’s statement to the lumad parents “remains to be empty words meant to simulate his administration is reform-oriented and sincere. “Come enrollment time, many will be staggered that they shall not be able to access the much-vaunted Free Education of Duterte”. They likewise called on all students to unite and challenge the veracity of Duterte’s sincerity in providing “free tertiary education for all”. 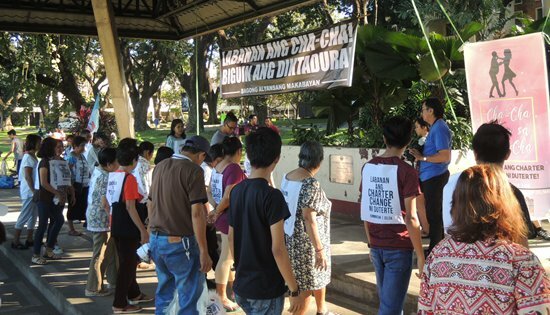 QUEZON CITY – Karapatan and SELDA held a dance protest against charter change on February 3, 2018 at the Grandstand, Sunken Garden, UP Diliman, Quezon City. The event, dubbed Cha-cha laban sa Cha-cha, was attended by human rights advocates, martial law veterans, members of progressive organizations, and individuals who have expressed their opposition to Duterte’s charter change. “If the Duterte regime is inching the country closer to a full-fledged dictatorship to the tune of Cha-cha, the people will unhesitatingly dance to the tune of resistance,” said Karapatan secretary general Cristina Palabay. Karapatan explained that the current proposals in Congress which aim to change the constitution pose as dangers to the people’s hard-won rights. The groups reiterated that several efforts to change the constitution have failed in the past because of resounding protests from the people. In past administrations, proponents of charter change have consistently peddled its passage, primarily targeting the removal of provisions in the current constitution which aim to protect the country’s economy. “Now, a more treacherous version has seeped into the heads of power-hungry and greedy politicians, and it has found a perfect mascot in the form of a wanna-be tyrant,” added Palabay. “To frustrate such ambitious and self-serving efforts, we urge organizations and individuals to undertake different forms of actions to protest this anti-people charter change,” concluded Palabay. NAVAL, Biliran – In pursuit of the National Irrigation Agency’s (NIA’s) commitment to provide an efficient, effective and sustainable irrigation services in support of the farmer’s livelihood and the government’s program for food self-sufficiency and inclusive economic growth, the NIA Leyte Irrigation Management Office - Region 8 conducts a stakeholders forum on January 31 at Marvin’s Seaside Inn, Brgy. Atipolo, Naval, Biliran. Engr. David P. Adongay Jr., District Engineer of the Department of Public Works and Highways (DPWH) Biliran District Engineering Office participates the said forum on behalf of Engr. Edgar B. Tabacon, DPWH 8 Regional Director. Engr. Fermina B. Aling, Acting Regional Manager, NIA 8 says that the rationale of the stakeholders’ forum is to establish a covenant in support of faster and better implementation of irrigation projects and sustainable and reliable irrigation service and to solicit the assistance of the stakeholders for the immediate restoration of the communal irrigation systems and the speedy recovery of irrigation communities devastated by typhoons Urduja and Agaton. During the forum, Engr. Estelita S. Sumile, Manager, Engineering and Operations Division shares the status of irrigation development of CY 2017 projects and the proposed CY 2018 projects of the region while Engr. Alejandro C. Culibar,D.M., Acting Division Manager, Biliran-Leyte del Norte- Leyte del Sur IMO tackles the province’s status of irrigation development of CY 2017 projects and the proposed CY 2018 projects. Engr. Conrado M. Samson, OIC, Operations and Maintenance Section also gives updates on the damages of typhoons Urduja and Agaton particularly on irrigation damages. Adongay says that on the part of the rehabilitation assistance, DPWH is willing to provide equipment to be used for the immediate restoration of the communal irrigation systems and for the speedy recovery of irrigation communities devastated by the said typhoons. He clarifies that the equipment should be requested from the Regional Director through the District Office to determine if the equipment to be borrowed is not currently used by the office because at present, Biliran DEO is prioritizing the restoration of all the damaged infrastructure facilities on the national roads and highways facilities and its national bridges. “Be ensured that they can immediately avail the equipment in case the Regional Director will approve their request and whenever the equipment is available,” says Adongay. Adongay also says that the district office will support the implementation of NIA’s projects particularly on the implementation of their drainage canals considering that most of the DPWH projects at present are road widening improvement so some of the canals constructed by the NIA will be affected during the road widening project. 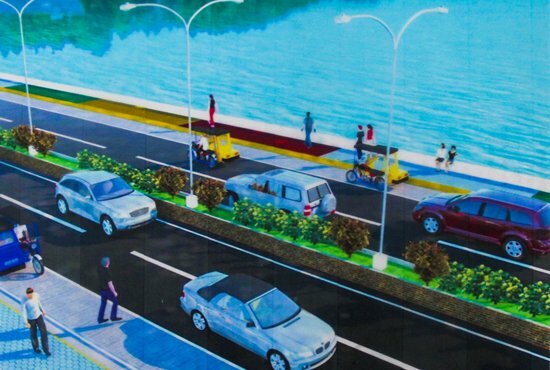 “We are requesting NIA that before the start of their project implementation, they should coordinate with our office because if it crosses the national highway, we will be requesting from the Regional Office that we need to cut our national highways in order for the irrigation project to pass through the national highway,” says Adongay. 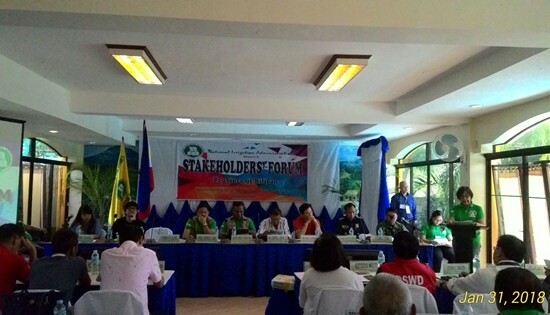 The Stakeholder’s forum ends with the signing of the covenant from stakeholders in irrigation development coming from NIA’s Office, Bishop of the Diocese of Naval, the Representative of the Lone District of Biliran, the Provincial Governor, the Municipal Mayors and the Municipal Agriculturists of the Province of Biliran, the Regional Directors in Region 8 and the Provincial Heads in the said province of the various government instrumentalities and agencies like the Philippine Army (PA), the Philippine National Police (PNP), the Department of Agriculture (DA), the Department of Natural Resources (DENR), the Department of Health (DOH), the Department of Education (DepEd), and the Philippine Information Agency (PIA), the Chairman of the Kapisanan ng mga Broadcasters ng Pilipinas (KBP), Chiefs/ Representatives of selected non-government organizations (NGOs) and the Presidents of the IAs in the province. ILIGAN – The Department of Trade and Industry (DTI) awarded 1,500 livelihood packages as well as 0%-interest microfinance loans to the internally displaced people (IDP) of the Marawi siege during the DTI Negosyo Seminar Para sa Marawi on 30 January 2018. “We want to assure the IDPs that President Duterte’s administration continues to provide more business and livelihood opportunities through the DTI Negosyo Seminars being given to help them recover soon,” said DTI Secretary Ramon Lopez. There were 1,500 participants and beneficiaries who attended the Negosyo Seminar. One of them was Mr. Alikman Nata, who intends to share the benefits of the livelihood package to his group, the Lanao Muslim Youth Association. As the head of Bangon Marawi’s Subcommittee in Business and Livelihood, DTI had earlier distributed 588 livelihood packages and conducted Negosyo trainings to 1,963 IDPs as of December 2017. There were also 240 beneficiaries who were linked to financial institutions. The Department also allocated P50 million this year to fund the Shared Service Facilities (SSF), providing Maranao entrepreneurs with facilities and knowledge that match their business needs. This is apart from the budget provision to support other Bangon Marawi programs in providing mobile rice mills, tricycles, vehicles, and the construction of public markets. DTI flew in different business experts to teach business preparedness, opportunities spotting, product development and marketing, financial literacy, and franchising. The beneficiaries were likewise briefed on the microfinancing loan programs of the government through the Small Business Corporation (SB Corp.), which developed a special 0%-interest microloan program for Marawi IDPs. This program has a grace period to help in the quick recovery of the IDPs. It started last December 2017 and has benefitted a total of 229 borrowers. 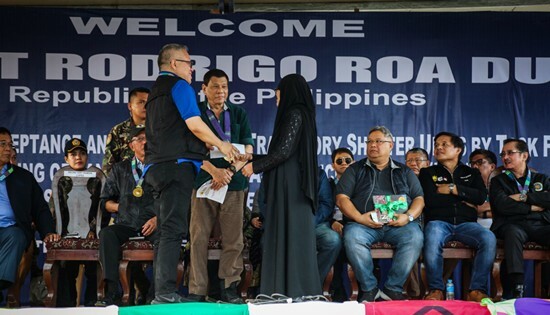 During the acceptance and distribution of transitory shelter units by Task Force Bangon Marawi (TFBM) with President Rodrigo Roa Duterte in Brgy. Sagonsongan, Marawi City, Sec. Lopez turned over the 0%-interest microfinance loan from SB Corp. to 150 beneficiaries, where 95 of them are public market vendors. The beneficiaries were represented by Ms. Rocaya Macabantog, Mr. Abbas Inidal, Mr. Allan Carimbaran, Mr. Acadon Macapundag, and Mr. Cosain Solaiman. The 0%-interest microfinance loan program for the 150 beneficiaries amounted to P2.19 million. This is a part of the P100 million-fund under the Pondo sa Pagbabago at Pag-asenso (P3) loans allocated for Marawi entrepreneurs by SB Corp, an attached agency of DTI. TACLOBAN CITY – The annual employment rate in Eastern Visayas slightly increased to 95.6 percent in 2017 from 95.5 percent in 2016, ranking sixth among the regions with high employment rate in the country (see table below). Employment rate is the proportion of employed persons to total labor force. Out of the estimated 3.0 million population 15 years old and over in 2017, about 1.9 million were economically active or in the labor force. This number translates to an annual Labor Force Participation Rate (LFPR) of 60.3 percent. This figure is 1.8 percentage points lower compared to the previous year’s LFPR of 62.1 percent. Among the regions, Eastern Visayas registered the sixth lowest annual LFPR. The underemployed persons or those employed persons who express the desire to have additional hours of work in their present job or to have additional job, or to have a new job with longer working hours was estimated at 402 thousand. This is equal to an underemployment rate of 22.6 percent, lower than the 28.3 percent recorded a year ago. The region had the fourth highest underemployment rate in the country. Meanwhile, about 82 thousand persons in the labor force were unemployed. This translates to an unemployment rate of 4.4 percent, slightly lower than the 4.5 percent rate recorded in 2016. Eastern Visayas ranked sixth among the the regions with low employment rate. The preliminary results of the Annual Labor and Employment Estimates for are based on the average of the four (4) Labor Force Survey (LFS) rounds (January, April, July and October). QUEZON CITY – Department of the Interior and Local Government (DILG) Chief Eduardo M. Año calls on Punong Barangays to ensure that no tanod under their supervision uses firearms even in the performance of their duties. Año reminded all Barangays that tanods or community brigades composed of civilian volunteers appointed by the Punong Barangay upon recommendation of the Barangay Peace and Order Council are not allowed by any law to carry firearms even in maintaining peace and order in their communities. Año said that tanods may only use nightstick with teargas (probaton) with belt and holster, handcuff with holster, whistle, flashlight, raincoat, rainboots, small notebooks and ballpens, first aid kits, and other non-lethal gadgets. “Bagaman mahalaga ang papel ng mga tanod sa pagtulong sa pagbabantay at pagpapanatili ng kaayusan at seguridad sa mga komunidad, kailangan pa rin pong linawin at ipaalala na hindi sila otorisadong magdala at gumamit ng baril kahit pa ang armas ay personal nilang kagamitan at kahit pa mayroon silang permit to carry outside their residence,” he adds. The DILG chief explained that Republic Act (RA) No. 10591 known as Comprehensive Firearms and Ammunition Regulation Act enacted in 2012 has revoked the authority of police auxiliary units members such as tanods to carry firearms, which was previously allowed by Circular No. 2008-013 of the National Police Commission. “There is no longer any legal basis for arming barangay tanods,” said Año. “Ang mga tanod ay hindi po permanenteng mga manggagawa ng gobyerno kaya hindi sila maaaring gumamit ng armas maging iyong mga nakarehistrong baril ng LGU,” he says. “Ayaw na po nating may mapabalita pang tanod na sangkot sa paggamit ng baril kahit pa ikatwirang dahil ito sa kanyang pagganap ng kanyang trabaho sa barangay peace and order. Gawin po natin ang ating trabaho ng hindi lumalabag sa batas,” Año warns. Punong Barangays, on the other hand, are entitled to possess and carry firearms within their territorial jurisdiction, subject to appropriate rules and regulations, as stated in Section 389 (c) of the Local Government Code but only in the performance of their peace and order functions. Meanwhile, DILG Spokesperson ASec. Jonathan E. Malaya reminds the public that among the indications of a good punong barangay ‘worth voting for’ in the upcoming barangay elections are those knowledgeable of the powers and functions as well as limitations of barangay workers such as tanods. “Unang-una, nananawagan tayo sa publiko na bumuto sa darating na barangay elections. Pangalawa, piliiin po nilang mabuti ang ating mga ihahalal nang sa gayun ay maging maunlad at mapayapa ang kanilang komunidad na ligtas sa kapahamakan ng iligal na droga, kriminalidad, at korapsyon,” he said. QUEZON CITY – “Duterte’s nauseating hubris to target legal and progressive organizations which he brands as ‘enemies of the state’ shows his contempt for the exercise of the people’s basic right to freedom of expression, association and assembly, among other civil and political rights, and to any and all forms of opposition to his anti-people policies,” said Karapatan Secretary General Cristina Palabay, in response to Duterte’s recent statement where he reiterated that he will go after so-called “legal fronts” of the Communist Party of the Philippines (CPP). “Making no distinction between armed combatants and civilians gives state forces carte blanche to kill, arrest, threaten, and harass any one, including free speech advocates, unarmed activists, peasants, workers, indigenous peoples, church workers, among others. These tactics, used by the Marcos dictatorship and subsequent regimes such as that of Benigno Aquino III and Gloria Macapagal Arroyo, are acts of desperation and paranoia,” Palabay said. Karapatan has recorded 84 human rights defenders killed under the Duterte administration, many belonging to local peasant and indigenous organizations working towards advocacies on genuine land reform and defense of ancestral lands from big landlords and businesses. Since 2001, 697 human rights defenders have already been killed. Many more have been illegally arrested and detained. Palabay also challenged Duterte in his assertions of illegal financial transactions. “We are not facing reports of undeclared P100 million in investments, nor are our immediate family members implicated in smuggling $125 million worth of drug shipment. We are not befriending plunderers like Marcos and making compromise deals with thieves. Unlike Duterte and politicians in the same rotten basket, we are not the ones lacking accountability,” she responded. “Unlike the Duterte regime which has cowered to the dictates of US lackeys in his Cabinet and has shamelessly surrendered our sovereignty to US and China, progressive organizations have stood firm against State repression, fighting alongside the Filipino people throughout different administrations. The 126 victims of political killings and the thousands more killed in the course of the drug war, the many anti-people policies, compounded by the brazen submission of our territories justified by insulting the capacity of Filipino scientists are indications of the Duterte government’s ineffectivity and inutility,” concluded Palabay.